Today was a gorgeous day in South Carolina. Yesterday was also a great day. Yesterday we gave all three dogs a bath out in the driveway. Good to get the winter stink off of them. After the baths we took a stroll along the shoreline. The lake level is down at its lowest and walking along the shore is a pleasant way to spend a little time. As we walked along I saw a hawk, a small one. He landed high in one of our neighbor's trees. Lucky for me I had my camera with me. These are probably the worst pictures to share, but I can't figure out who this little guy might be. The dark coloring on his cheek makes me think it might be a falcon of some kind. I will leave the better ID to some of you---- let me know! He looked around and turned his head a good bit. In the photo above you can see the white tip on the tail feathers. I think it MIGHT be an American Kestrel. Those stripes on the face really make me think this is the correct bird. What do YOU think? For those who didn't read or hear about the hawk in the Library of Congress, it was a female Cooper's Hawk. She was rescued and will be treated for dehydration and eventually released into the 'wild' of DC. Just after we saw this unknown little hawk/falcon/kestrel we saw a Bald Eagle fly up the lake. These are such majestic birds. Even from afar you can tell it is a Bald Eagle. As we continued our walk we saw lots of footprints in the sandy shoreline where animals go to the water's edge. Guess my next form of study will have to be animal tracks. ﻿There were tons of all kinds of mussel shells and some spiraled shells, like I shared on my previous posting. I was surprised to see one quite so large. This is my boot -- size 7. Today was a day for working on the front woods. I am trying to keep a balance of nature here. Leave the trees, mostly, get rid of the honeysuckle, smilax, and muscadine vines. I thinned some of the trees-- 5 Sweetgum can't grow in a four square foot area. One of the places I had marked in my mind for a Mountain Laurel there was a large honeysuckle vine-- the trunk was about an inch in diameter. 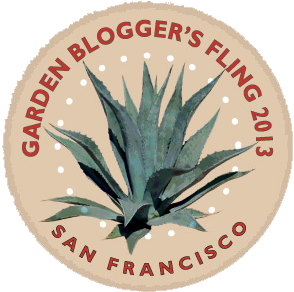 As I pulled and dug this neverending vine out, I came across my Great Discovery. I found a Cranefly Orchid. I wasn't 100% sure at first. Posted the photo on Facebook and did a little more investigating online. Mine didn't seem too purple on the underside of the leaf....until I went and looked again. This is the first picture I took. Size and shape were right, but from this photo, it didn't look like it was dark purplish on the underside. So I went back out and looked again.....it is a Tipularia discolor!! Oh yeah!! I marked the area with some branches stuck in the ground. Don't want the dogs running through them nor do I want to dig right there. Will have to watch when I plant anything in there. Another mystery to me is what is growing near the orchid. Anyone have any ideas what this might be?? The stems are reddish and the new growth is also red in color. It has a sharp-toothed leaf, interesting coloring. I am clueless to what it might be. Help?? Daricia has provided an answer! http://www.duke.edu/~cwcook/trees/chma.html It is a Striped Wintergreen or Striped Pipsissewa, Chimaphila maculata thanks Daricia!! After all my front woods discoveries I thought I would go out back and check the Witch-hazel. Still just a few blooms, but it is young-- next year!!! This past week while at an Arboriculture class at the extension, one of the slides was of Baldcypress. It was funny as the trees in the slideshow were the ones I have taken photos of as we drive by. I had a red light on my way to the extension office that morning next to these trees. Camera in hand I rolled the window down and tried to get a good picture....again. 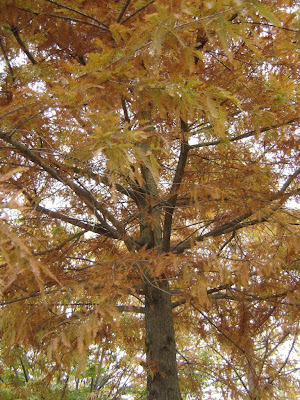 Taxodium distichum, Baldcypress is one of two cypress in the southeastern United States. Many people think of Baldcypress as the swamp tree with the knees. When I first heard of 'knees' on a tree, I wasn't sure what it meant. 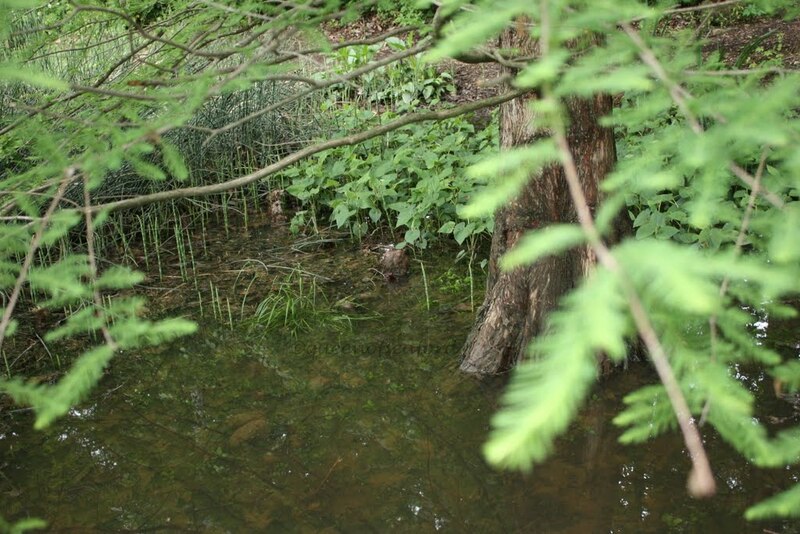 If you look at the photo below, the knees are visible along the back edge of the water. These are not big knees, but they are above the water line. The knees are part of the root system. At one time it was believed that the knees were above the water to provide oxygen to the roots. 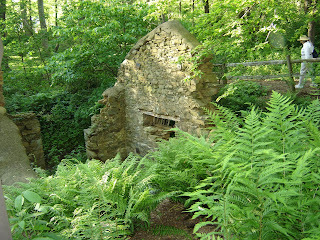 In the article from the Arnold Arboretum there is an incredible photo of the root system. It is an amazing underground structure. It is now believed that the root system is a scaffolding support system to hold the trees erect in the swampy conditions...buttressing the base of the tree. My favorite reference, National Forestry Service Silvics manual, has both answers for the knees. Trees are such interesting structures. When learning the difference between the Baldcypress and Dawn Redwood I had two different people give me their methods of knowing which is which. 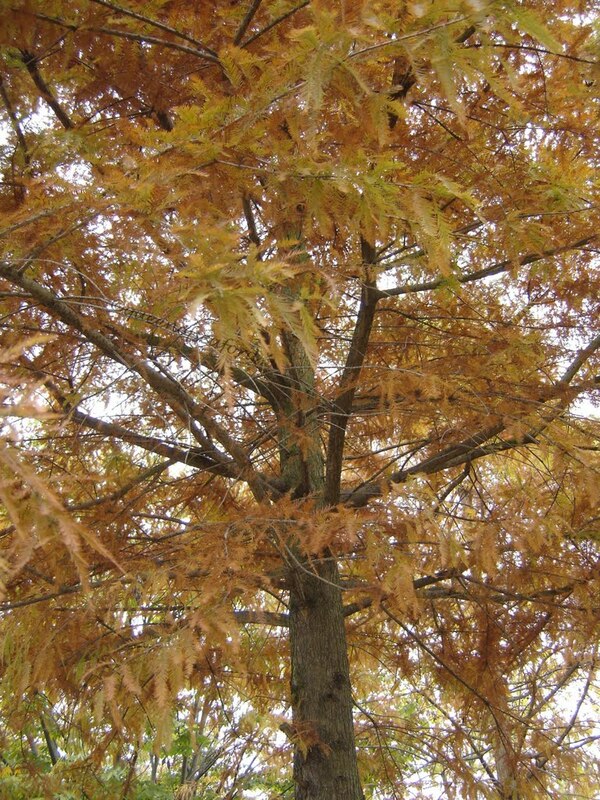 Taxodium distichum vs Metasequoia glyptostroboides. 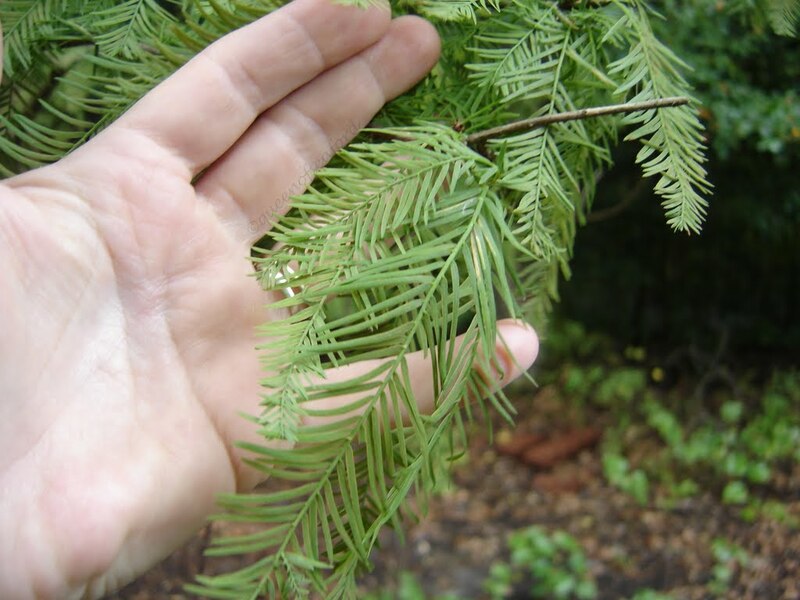 One said Taxodium DISTichum ---leaves arranged like discs, one on top of the other, alternating along the stem or METAsequoia...the leaves meet--arranged opposite. 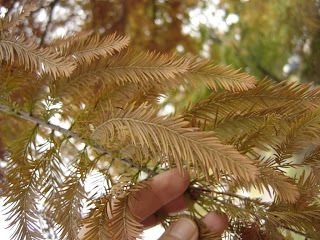 The other person said the Metasequoia is MEATIER...thicker leaves. Right Les? Baldcypress is called bald because it loses its leaves in the fall, after turning a glorious golden color. It is uncommon for a conifer to lose its leaves. 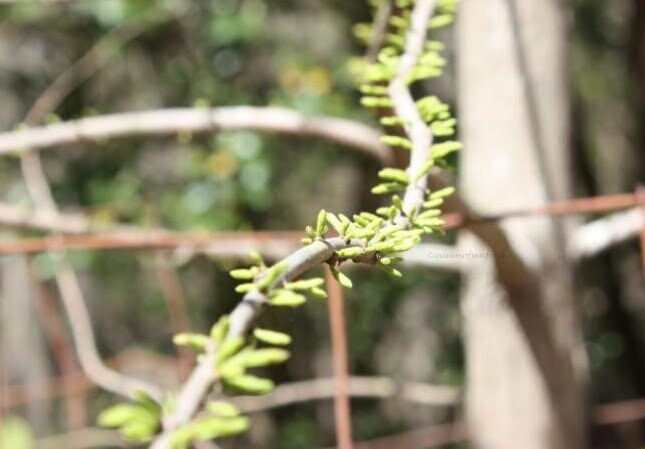 This tree is native to the US, its native range is from along the Virginia southern coast through the Carolinas, moving west into the Piedmont, south to Florida and west to Texas, including the plains of the Mississippi basin. The bark is reddish brown and as the tree ages it becomes shredded and coarse...it can peel off in strips. The young tree is pyramidal in shape, but as the tree matures, the top flattens out. The trunk flares out at the base, often quite enlarged. The moist wetlands of river basins are the choice sights for these trees. Knees seem to form more often in wet areas. The varied wetland environments are an interesting read (more detail) on the Forestry sight mentioned above. The Baldcypress do not do as well in stillwater forested wetlands as those in terrestrial forests. The leaves are soft to the touch and drop in the late fall. In the spring the new leaves emerge for the new season. It is a monoecious tree, its fruits mature in one growing season. The female fruits are rounded cones, either in clusters of two, three or alone. 400- 600 years. It takes approximately 200 years to reach sufficient size to for lumber to be harvested. After 200 years old many do not get any larger and start to die back from the top from a fungus, causing rot from the tip. This last photo was taken in downtown Asheville. I was so surprised to see a number of these Baldcypress planted in an urban setting. Maybe these are a smaller cultivar? One can only hope. The seeds are eaten by wild turkeys, squirrels, various birds and ducks. The tall tree tops are often the nesting sites of Bald Eagles and Osprey. The timber is used for construction, fences, planking in boats, and many other areas. Mulch is another product from the cypress tree and one of my commentors, Bill, sent this link along--http://chronicle.augusta.com/news/metro/2011-01-19/state-cypresses-endangered that ecosystems are endangered from over harvesting. Florida Forest Trees sight still says the knees are for obtaining oxygen-- so the debate still goes on. Virginia Tech has some good photos of the fruits of this tree. Floridata is another reference in a concise format. Today was a four hawk day, literally. I saw one on my way to the pruning class I was assisting with this morning. Unfortunately, this hawk was WAY up in the tree. Sorry to say, the other three hawks were sighted this afternoon, I was sans camera. It was supposed to be a quick run to the Pig before the next round of weather due in. So, take my word for it, three more hawks. This winter has been a glorious field day for watching birds. On New Year's Day I took a few pictures of the Pileated Woodpecker. Our woods are exspansive, so these are from a distance. Their wing coloring is a spectacular flash of black and white. This guy was really bashful about getting photographed. We also get Flickers in the backyard woods. CORRECTION!! THIS IS NOT A FLICKER-- This is a Red Bellied Woodpecker, what was I thinking??? This little guy is especially elusive--- do you see him? I was sitting at the desk in the laundry room and it looked like the bark was moving. This is the Brown Creeper that Randy and I have been talking about. This little bird is really hard to see and nearly impossible to photograph. The feeders have had a flurry of Goldfinch activity. Their winter colors sometimes make it hard to know for sure it is a Goldfinch. We have had some diving ducks in the lake, see them down there? It is a group of Hooded Mergansers. These ducks are teasers... just when you have the camera focused, they go under! While looking at/for the Mergansers, I saw a Great Blue Heron, fishing under the dock. Must be good fishing as the Belted Kingfisher hangs out on the dock as well. In the woods to the side of the house are lots of little birds, this little one is so puffed up from the cold that I am not certain what kind of bird it is. The Eastern Towhees or Rufus Sided Towhees are ground feeders. There were a number of them looking for food when the snow was on the ground. I threw some seed out and some orange pieces. Against the snow the Bluebirds stand out so well! The most exciting sighting of a bird this week was not here in South Carolina, but in Washington, DC. This hawk was photographed in the Library of Congress.....INSIDE!! Look closely for him against the ceiling. Absolutely amazing! So, keep your eyes open -- you never know when you might see something pretty exciting! Remember the Great Backyard Bird Count is Feb. 18- 21. I remember while volunteering at the York County Cooperative Extension office getting a phone call asking about a tree with tulip flowers. 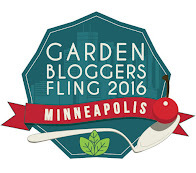 This was early in my Master Gardener experience. 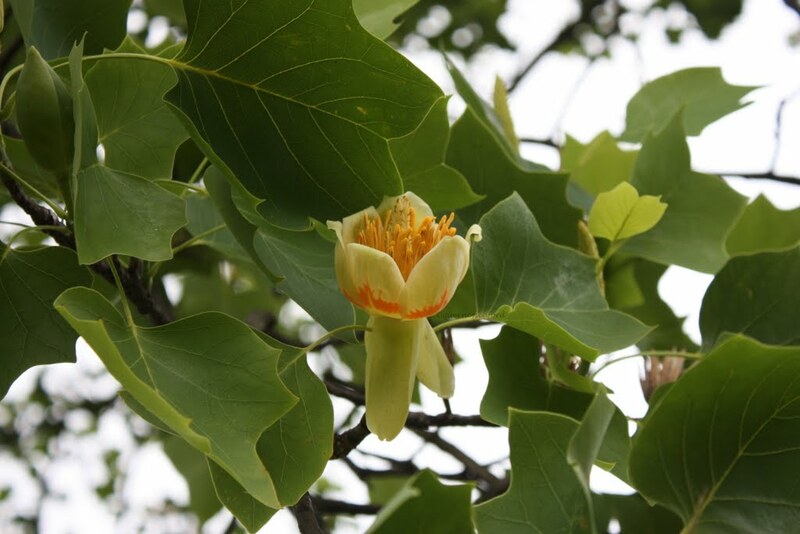 I thought it was Tulip Poplar, but wasn't sure. Do you have 'knowledge' that pops into your head and you have no idea if it is correct or not? This is where I was...why did I know this? I guess the source of my information doesn't matter, I was correct. Looking high into the tree, you can see beautiful creamy yellow/white flowers. I wanted to find out more about this tree. 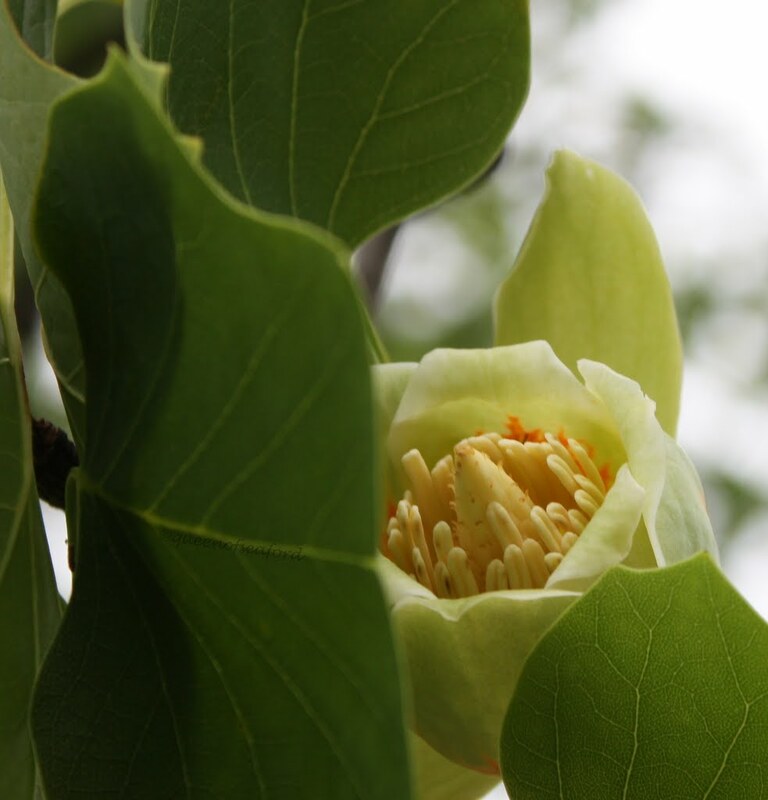 The Tulip Poplar, Liriodendron tulipifera, also goes by Tuliptree or Yellow Poplar, though it is not a Poplar but in the Magnolia family. The name Yellow Poplar is because of the color of the Heartwood. While on our study trip last spring I had the opportunity to see these beauties up close. There was a tree in one of the gardens with blooms on some lower branches. The flowers bloom in the spring and are usually so high in the tree that they go unnoticed. 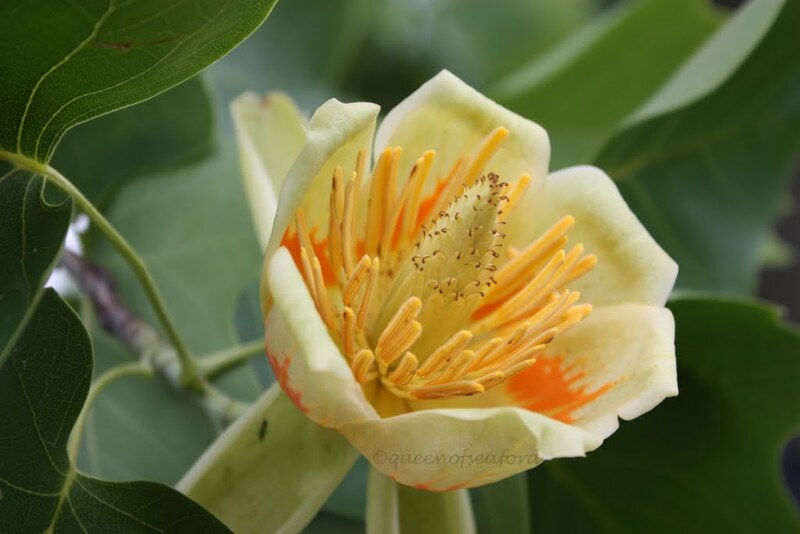 It is only when the faded bloom falls to the ground that you know there is a Tuliptree nearby. The flower measures 2 inches across. This is often one of the tallest trees in the forest, growing 80- 100 feet tall and lives 100- 150 years though in perfect conditions it could live up to 300 years. It loses its lower branches as it gets taller, leaving a straight tall trunk and is a fast grower. The 3- 6" leaves are almost square, lobed and even margined. Its leaf stalk is long. In the fall these large leaves turn a strong yellow. I thought I had a photo of the fall foliage, though I can't find it. 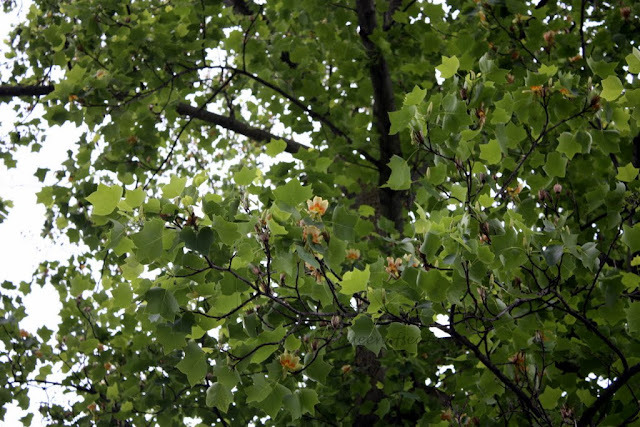 Yellow Poplar is a prolific seeder. The flower is a perfect flower and while it can self-pollinate, pollinators are very important. The stigmas are light colored when first emerged and are receptive to pollen. After they turn brown they are no longer receptive...this period of time is very small-- 12- 24 daylight hours. Seeds form in the conelike center and winged samaras mature late summer to mid autumn. 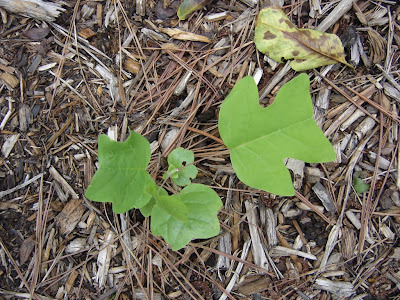 The seeds can remain viable on the forest floor somewhere between 4- 7 years. In the winter the open aggregate (composed of a cluster of carpels belonging to the same flower, as the raspberry.) appear to be tulips left on the tree. The bark is light gray with shallow furrows, becoming darker as it ages. As it is a straight trunk the wood is highly valued for its use in furniture and framing construction. It is a good source of wildlife food and valued as a honey tree. Morel mushrooms grow best under these trees. It is the largest and most valuable hardwood in the U.S. This tree is native to the United States, from southern New England to north central Florida and west to Michigan and Louisiana. Some of the largest specimen have been found along the Ohio River valley and the slope of the mountains of North Carolina. It likes moist soils and can be found along streams and river banks. This photo is the pair of Liriodendron tulipifera is from my backyard. I was thrilled to find we had one in our yard and let the builder and the landscape folks know I wanted to be sure that this tree pair was unharmed. 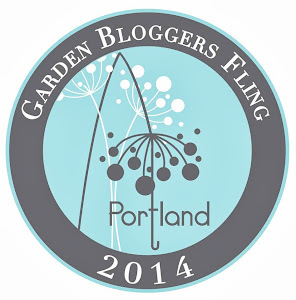 I look forward to seeing it this spring. The main online source of information is the Forestry Service Silvics Manual, one I use quite a bit. I also used some of my tree books from my home library. Taylor's Guides, Trees, Smithsonian Handbooks, Trees, Common Native Trees of Virginia, and Trees of the Carolinas Field Guide. Next week's tree-- Bald Cypress.